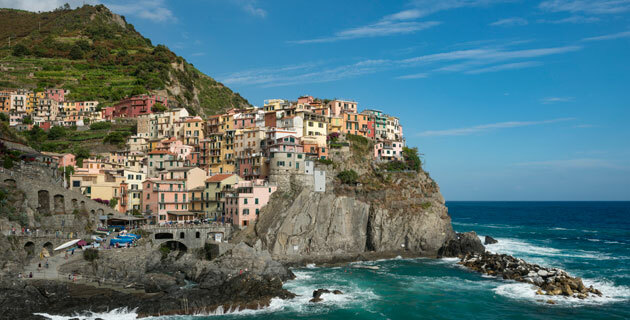 This leisurely exploration of Italy’s varied northern regions, from the romantic Lake District and dramatic Cinque Terre to beloved Tuscany, the majestic Dolomites, and canal-laced Venice, offers a refreshing perspective on a well-known land. In the company of our congenial small group, we celeb­rate the Italian penchant for hospi­tality, good food, and good living. In a word, splendido! Please note: This trip involves considerable walking up hills or stairs, and on uneven or cobblestone streets. In addition, Italy does not allow buses to enter many historic city centers, meaning that we will be walking to and from our tour bus, which must park in designated areas. You should be in good physical condition to enjoy this trip to the fullest. Situated on the shores of Lake Maggiore, the 240-guest La Palma Hotel is surrounded by lovely Italian gardens. It features a garden-view restaurant, bar, lounges, Internet access, laundry and dry cleaning services, fitness room with panoramic views, solarium, Jacuzzi, sauna, and heated lakeside swimming pool with a view of the Borromean islands. Air-conditioned guest rooms are fully equipped with private bath with hair dryer, mini-bar, in-room safe, balcony, TV, and phone. An intimate family-owned and operated 58-room hotel located just a short walk from the bay and a private beach, the Metropole features a restaurant, bar, Internet access, laundry and dry cleaning services, fitness center with massage services and Turkish bath, and outdoor pool. Each air-conditioned room has a private bath with hair dryer, in-room safe, TV, and phone. Please note that guest accommodations are provided in two separate buildings on the property, both of which are in close proximity to each other. Located in the heart of Florence, the Hotel Rivoli Boutique is set inside a restored 14th-century Franciscan convent, and features original architectural details dating back over 500 years. Amenities of this boutique hotel include a restaurant and bar, complimentary Wi-Fi internet access, and an internal garden patio featuring a hot tub. Every air-conditioned guest room has been skillfully restored and each offers unique touches, while all include private bath with hair dryer, classic Tuscan-style furniture, in-room safe, mini-bar, TV, and phone. Please note that due to the unique nature of this hotel, room size and décor will vary. This Liberty-style hotel in an updated 1898 coach station sits a short walk from the Bolzano train station and the South Tirol Museum of Archaeology. This hotel boasts a restaurant and bar, sun terrace, garden, fitness center, and sauna, and offers complimentary Wi-Fi internet access and laundry service. All 65 air conditioned guest rooms feature a private bath with hair dryer, TV, in-room safe, and phone. Recently opened in Spring 2017, the Palazzo Veneziano sits in the trendy Venice neighborhood of Zattere. It overlooks the Giudecca Canal, the widest promenade in Venice with numerous bars and restaurants. Hotel amenities include a bar, library, internal courtyards, and complimentary Wi-Fi internet access. Each of the 84 guest rooms have Venetian furnishings, private bath with hair dryer, mini-bar, in-room safe, TV, and phone. A shaded, color map of Italy, at a scale of 1:1,000,000. A detailed, plastic-covered city map of Florence at a scale of 1:7,000. Evocative of Italy and its diverse cuisine, this classic book, organized geographically, offers a cook’s tour of the country. It’s a well-informed and wonderful culinary guide. From Cicero to Dante, Giuseppe Verdi and 20th-century Italian politicians, Gilmour traces the history of Italian life and culture. Award-winning author and scholar Luzzi presents Italy in all its glory and squalor – its artistic magnificence, north-south disunity and its dirty politics and corruption – in this highly personal portrait. Burckhardt’s classic portrait includes dozens of illustrations, maps and photographs of architecture and early Renaissance art of Siena. With authority, Madden tackles the history of the celebrated city from Roman times onward. A well-written, entertaining history of the Medicis in Renaissance Florence. Great to read before going to Florence, where the influence of the Medicis and the artists they supported is still very much in evidence. A cultural and social history of the city focusing on the great art and famous monuments, featuring vivid color pictures and illustrations. With 112 color illustrations and four maps, the Genius of Venice presents the magnificent buildings of the celebrated piazza as, in the words of John Ruskin, the “living books of history” in this handsome cultural history. This omnibus Penguin Classics edition includes Lawrence’s three travel tales, each very different in tone and all wonderful: Sea and Sardinia is a nostalgic look at traditional ways of life; Twilight in Italy, an evocation of Lawrence’s memorable stay on Lake Garda; and Etruscan Places, his musings on ancient sites, including the painted tombs of Tarquinia. Twenty years later, Mayes is still besotted by Italy – her house, the tumbling geraniums, the people and the food – all lovingly documented in her best memoir yet. 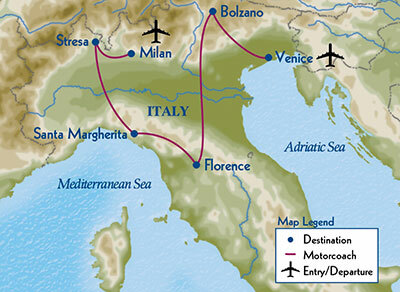 With interludes in Portofino, Assisi and Rome and a focus on Renaissance master artist Luca Signorelli. Set in the 1960s, this coming-of-age tale follows a young boy’s encounters with the sights and people of the seaside town of Portofino, while he avoids his missionary parents’ constant bickering and their attempts to convert the locals.